Goalkeeper Lewis Ward has left the Cobblers - and immediately been sent out on loan to Forest Green Rovers. The 21-year-old was signed on a season-long loan from Sky Bet Championship side Reading in July by then boss Dean Austin and was expected to challenge for a first team place, but he was unable to dislodge David Cornell as the club’s number one. Reading have now announced that Ward has gone on loan to Town’s Sjy Bet League Two rivals Forest Green Rovers for the rest of the season. Ward failed to make a single league two appearance for the Cobblers. He did play four Checkatrade Trophy matches, as well as the Carabao Cup first round clash at Wycombe Wanderers in August. 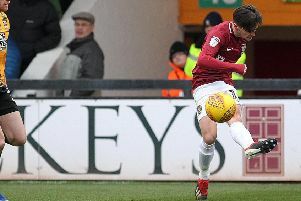 His last appearance for the club was in the 1-1 Checkatrade Trophy draw at Cambridge United on December 4, with Ward playing his part with two saves as the Cobblers won the subsequent penalty shootout 4-2. He hasn’t been involved in a match day squad since the 1-0 win at Crawley Town on December 8, with Luke Coddington being named on the bench for all matches since then. Talking to fgr.co.uk, Ward said: “It’s good to be here now and I’m really grateful that it is done and dusted and I’m looking to kick on. “I think there was some talk in the summer but it didn’t come off. “I wasn’t playing at Northampton and the chance came up again to come here and I thought I’d give it a go. “I played a lot of games last season in the National League which was crucial to get first team experience and I think ticking that box was done and waiting for the League move this year was the right decision. Despite Ward’s departure, the Cobblers still have three goalkeepers on their books, with Cornell being backed up by contracted pair Coddington and James Goff.